Just as IP protections for digital music lagged in the early 2000s, IP protections for 3D printing lag today. My father-in-law, Carl, ran a precision machining business for the better part of 40 years. Although he’s now retired, he still retains an interest in new technologies as part of his relationship with a local college. As my son approaches his 14th birthday later this month, Carl asked me if he had a 3D printer. The answer is no, but his question prompted me to think again about the larger implications of 3D printing and IP rights and how they echo the earlier challenges that arose with digital music and illicit, unlicensed downloads. Unlicensed downloads posed significant challenges for higher education as the new millennium approached. Institutions found themselves hosting file sharing services such as Napster that often facilitated breaches in copyright law. For the music industry, it wasn’t just the establishment of digital formats and distribution as an industry standard, but also the data transfer speed students enjoyed in their dorm environs that opened the floodgates. As the music industry grappled with how to enforce their artists’ rights, higher education institutions (HEIs) began to face both philosophical and practical consequences as ethical, legal, and bandwidth issues coalesced and landed with a reverberating thud. As (sometimes inadvertent) hosts of peer-to-peer sharing systems, HEIs felt the heat from legislators, who began to approach the intractability of the problem with regulatory compliance rules. But for many of the music industry’s smaller and independent players – who struggled the most with how to preserve and protect their intellectual property rights – it was too little too late. Federal lawmakers are often well behind the curve when it comes to dealing with unanticipated consequences of new technology paradigms, and many in tech transfer see similar issues looming with new additive manufacturing or 3D printing technology. Low entry costs and existing advanced computer aided design (CAD) software give a tremendous breadth of possibilities for 3D printing IP development. But with that development also comes the possibility of IP infringement. Additive manufacturing is now an important part of many engineering and advanced manufacturing programs at colleges and universities worldwide. More than 7000 patent applications related to 3D printing have been filed in recent years, including one owned by Miami University. At a 2016 conference hosted by the US Patent and Trademark Office (USPTO), USPTO Deputy Director Russ Slifer indicated that patent filings related to 3D printing technology grew 23-fold in a five-year period (USPTO blog). One key concern surrounds the IP that resides in a basic CAD file. In some circumstances the IP extends beyond a copyright that might exist in the file itself to patent rights attributable to the printed product. Therein lies an interesting distinction: copyright protection can extend to the digital domain, whereas the patent in the generic case relates to the object produced. A digital rendering of a patented medical device has little practical utility, but a digital CAD file of the device might be highly valuable. US patent law provides remedies against infringers, as well as individuals or entities who induce others to infringe. In the earlier example of digital music files, most people – even those who have no experience creating or producing music – have some understanding of copyright comprising the artist’s intellectual property. How, though, would a typical end-user, especially a non-commercial home user, be aware of patent rights that might exist for a product that can be printed via a downloaded CAD file? Because the current patent rights enforcement regime requires the infringer (or those who induce infringement) to have knowledge of the existence of a patent, this leaves a loophole of sorts in the protections provided to innovators. A second, and equally important aspect is the IP nature of the printed product itself. A digital CAD file of a three-dimensional figurine from a well-known movie franchise may be copyrighted, but the printed object itself may also be subject to various elements of copyright protection, as well as trademark protection. A large part of the challenge for companies or individuals who hold these IP rights is that the low cost of some of the new additive manufacturing devices could allow end users to bypass elements of the basic business supply chain that have precluded this type of infringement in the past. Written by Reid Smith, Director of Technology Transfer and Business Partnerships, Miami University. 3D printer photo by Jonathan Juursema via Wikimedia Commons. 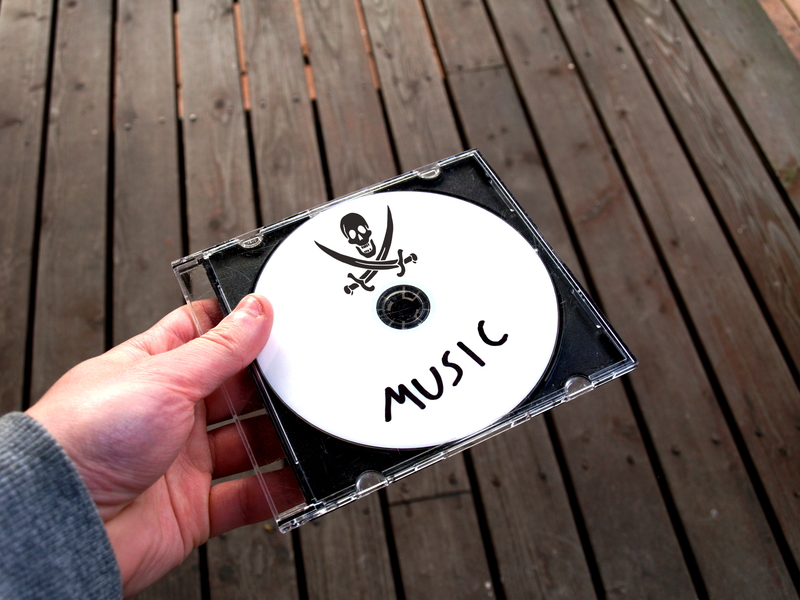 Music piracy photo by Santeri Viinamäki via Wikimedia Commons. Both used under Creative Commons license. This entry was posted in Technology transfer and business partnerships and tagged 3D printing, additive manufacturing, copyright, intellectual property, IP, patent. Bookmark the permalink.